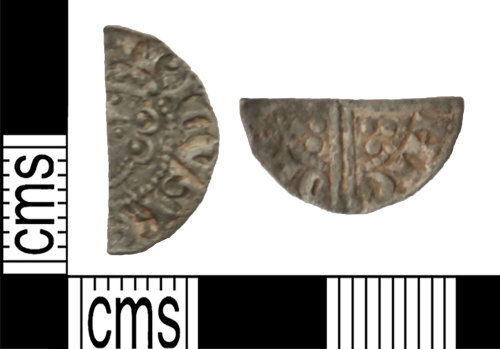 Silver medieval cut halfpenny of Henry III, dating to 1253 AD. Class 5b2, minted by Nicole at London. Obverse of forward-facing bust; RICVS RE. Reverse of voided long cross with three pellets in corners; NIC/OLE. The coin is 17.58mm in length, 8.69mm in width and 0.86mm in thickness. It weighs 0.70g.